Newly elected French president Francois Hollande is to promote French wine in China and educate the Chinese about wine through a series of events in the country. The French agriculture ministry has also promised 400 different wines from 12 regions across France will land in China in batches over the next three years. Targeting both the Chinese wine trade and consumers, the three-year campaign, starting from 2012, will help instill wine knowledge in importers, distributors and chefs, as well as invite consumers to wine tastings and French cookery courses. The 12 wine regions taking part in the campaign are: Alsace, Beaujolais, Bordeaux, Burgundy, Champagne, Corsica, Jura and Savoie, Languedoc Roussillon, Provence, Sud-Ouest, Val de Loire and Cotes du Rhône. France exports wine to more than 190 countries. In 2011, it exported 1.33 billion liters of wine valued at €7bn, €800m more than that of 2010. Although the US, the UK and Germany remain the three major export markets for French wine, Asia has risen to be a new growth engine, and one of France’s most promising emerging markets. 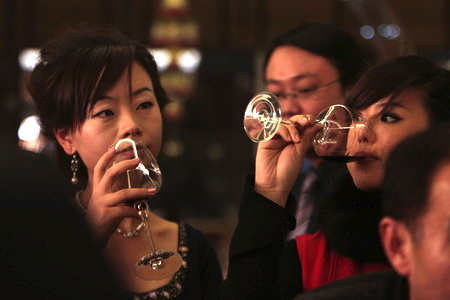 China is the fifth biggest importer of French wine in both volume and value terms. French wine exports to mainland China increased by 75.5% in value in 2011, compared with 2010, and by 36.4% in Hong Kong, with a considerable amount of French wine sold to Hong Kong later resold inland. Despite growth in consumption, public understanding of French wine culture is still in its nascent phase. A number of Chinese consumers still add Sprite, Coca Cola or ice cubes to wine to sweeten and lighten the taste, and few know the correct temperatures for preserving and drinking wine. This entry was posted on May 11, 2012 by The Oenophiliac in News. and tagged Alsace, Beaujolais, Bordeaux, Burgundy, Champagne, China, Corsica, Cotes du Rhône, Francois Hollande, Jura and Savoie, Languedoc Roussillon, Provence, Sud-Ouest, Val de Loire.